The iPhone 5 was, is, and remains inevitable. An iPhone, new to be certain, but still an iPhone. Some say this is a sign Apple has lost their drive for innovation. Others, a sign Apple has kept their sense of focus. Both are facets of a single truth -- that through craft something is revolutionized, refined, and one day, replaced. The question then becomes, where is the iPhone 5 along this continuum? Is it a boring, uninspired, end-of-line update that should have Apple desperately seeking to once again "think different", or is it iconically, deceptively, insanely great enough to delight customers, inspire developers, and once again drive the entire industry forward? Gone is the sandwich of chemically treated glass and stainless steel of the iPhone 4S and iPhone 4. And in their place the iPhone 5 offers an aluminum unibody, accented by glassed, that houses not only a new, all-digital Lightning connector, fast LTE 4G networking, a monstrous Apple A6 processor, but for the first time, a taller, in-cell display. The iPhone 5 doesn't offer a radically new shape, but the shape is about the only thing that's not radically new this year. 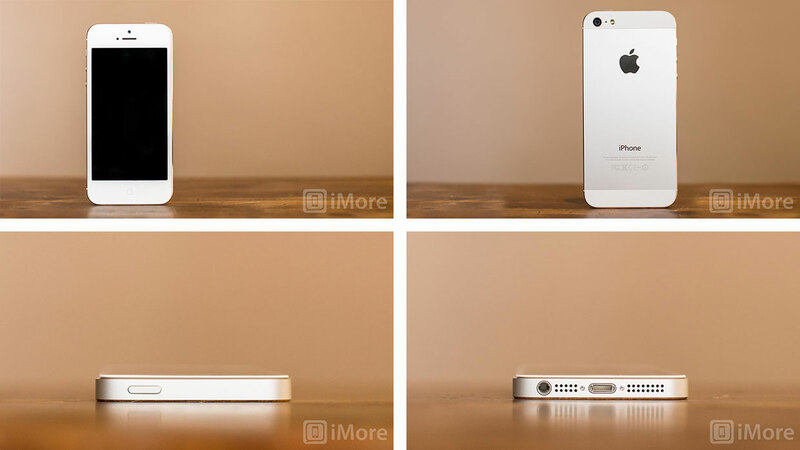 Measuring 123.8 mm high, 58.6 mm wide, and 7.6 mm deep, the iPhone 5 rises higher than the iPhone 4S but no wider. It's also 18% thinner and 20% lighter. It's so light and thin that it almost feels fake, like a dummy phone at a carrier store. Almost. Apple claims it's both bigger and smaller, that there's both more and less of it. And that's absolutely true. In fact, it takes a moment -- an awkward, giddy moment -- to adjust to the sensory paradox. Because the overall volume of the iPhone 5 is 12% less than its predecessor, it feels like it's gone from a short, substantial slab to a long, lithe slice. With a chassis carved from anodized 6000 series aluminum, hardened Gorilla Glass on the front, and inlays of ceramic or pigmented glass on the back, the iPhone 5 has been compared both favorably and ludicrously to precision, luxury time pieces. Hyperbole aside, the manufacturing process literally does have to be seen to be believed. Hardware buttons on the iPhone 5 are laid out the same way they were on the iPhone 4S and iPhone 4. You have the On/Off (Sleep/Wake) button on the top, the ring/silent button on the left, and the volume up (camera shutter) and volume down buttons beneath it. While the iPhone 4 Home button was nowhere near resilient enough to stand up to long term usage, the iPhone 4S fixed that problem with a better support system. The iPhone 5 feels even better than the iPhone 4S. The Home button feels "clickier" but more solid than before. The iPhone 5 still only comes in two colors, but this year those two colors are also two-toned. There's black and slate, and white and silver. The black is Darth Vader black, and can all but disappear on a dark surface in low light. The white is Storm Trooper white, its crystalline diamond-cut chamfers brighter and shinier than ever. While the blackout look of the anodized aluminum on the black and slate iPhone 5 is more singular, more monolithic, it will also show chips, scuffs, and scratches more readily than the naked aluminum of the white and silver model. Neither, however, are immune to that particular phenomena. I exchanged my first iPhone 5 after noticing a chip in the bezel, but the new one has held up just fine under normal, careful use. Unfortunately, there's no adamantium/vibranium super metal in the real world. The iPhone 4 and iPhone 4S had glass backs that were susceptible to shattering with sufficient impact. The iPhone 3G and iPhone 3GS had plastic backs that were susceptible to cracking along the edges. The iPods had and have stainless steel backs that have always been susceptible to scratching and scuffing with normal use. 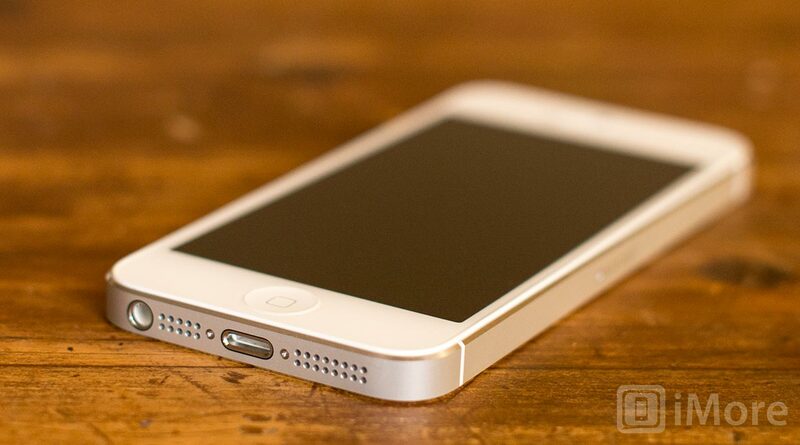 If maintaining a mint-condition iPhone 5 is a concern, look into getting a case or skin. While the aluminum finish is polished and and initially feels "slick", there's enough friction when gripped for it to not to be especially slippery. Back to the shape. 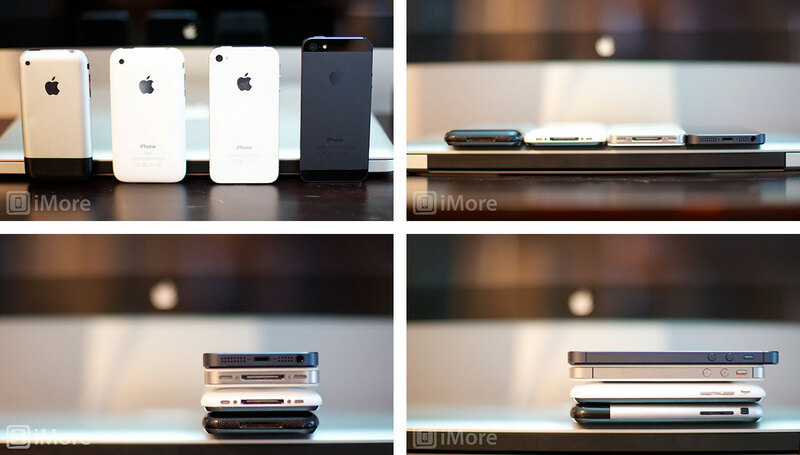 Yes, the iPhone 5 is every bit the flat, rounded rectangle the iPhone 4S and iPhone 4 were before it. That's intentional. It might be boring or unimaginative to some, and that's a fair point. But Apple's not playing at dice. They're not spinning fashion. They're making an iPhone. Apple is making an iPhone that looks like an iPhone the way a Lamborghini looks like a Lamborghini, and a MacBook Pro looks like a MacBook Pro -- the way any product from any high end brand looks like and embodies that brand. Apple conceived of this iPhone form back in 2005 and has been working inexorably towards it ever since. They're closer this year than any year past, achieving an unprecedented level of thinness and lightness, a screen that dominates the front as never before, and they've finally been able to return to aluminum for the back, albeit with glass still lingering at the top and bottom. In that regard, the leap from the iPhone 4S to the iPhone 5 is no less significant, ambitious, or impressive than the leap from the original MacBook Pro to the unibody MacBook Pro in 2008. In both cases, it wasn't about making something that looked radically different but about making something that worked radically better. That's how it should be. That's what great design is all about. And if there's one thing Apple nails more consistently and constantly than any other company in modern memory, it's great design. The real question is, once Apple fully realizes this vision of the iPhone, once they've gotten as close to perfecting it as technology allows, what will they do next? The 4-inch, 16:9 aspect ratio, 1136x640 resolution, 326ppi in-cell display is the iPhone 5's most obvious, most visually impressive new feature. Up until now, every iPhone has had a 3:2 aspect ratio display. 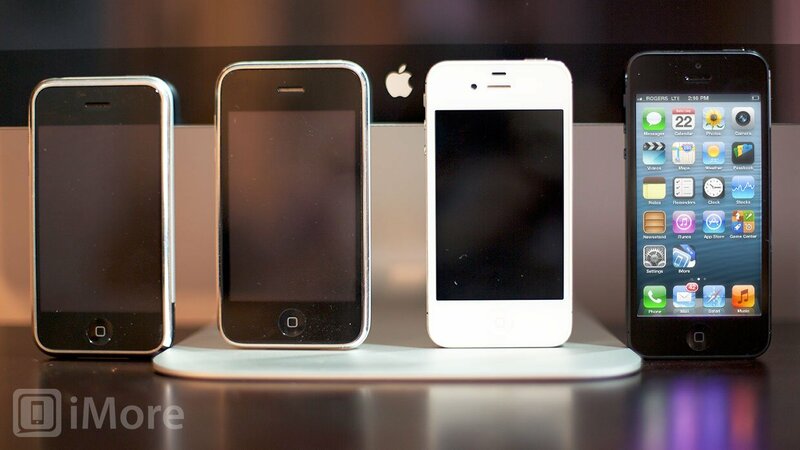 The original iPhone, iPhone 3G, and iPhone 3GS all had 3.5-inch, 480x320 resolution, 163ppi displays. With the iPhone 4 in 2010, Apple switched to the Retina display. It was still 3.5-inches, still 3:2 ratio, but the density doubled to 960x640 at 326ppi. That made the pixels essentially disappear. 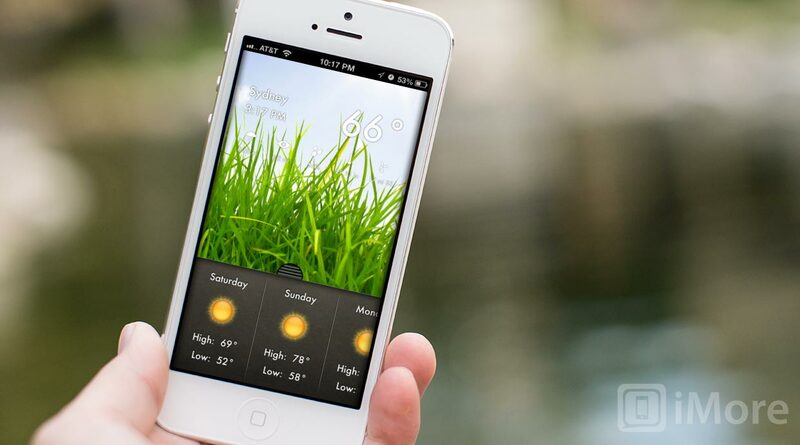 With the iPhone 5, for the first time, Apple has changed not only the screen size, but the aspect ratio as well. They've made it taller but not wider, bigger but no less dense. Retina was all about the quality of what you see. 16:9 is about the quantity. The reason for the screen size change was likely competitive, at least in part. Some percentage of the market was choosing a bigger screen instead of an iPhone. By switching to a bigger screen, Apple has increased their addressable market, and now people can choose an iPhone with a bigger screen. At the same time, Apple wants to maximize content and minimize distractions like bezels and casing. Given LTE 4G and the new, thinner design, Apple couldn't decrease the screen-to-casing ratio by staying with a 3.5-inch display. They can -- and did -- by switching to a larger, 4-inch one. So why 4-inches and 16:9 and not any bigger or the least bit wider? Likely because Apple didn't want to reduce the pixel density of the Retina display, impede the one-handed ease of use of the interface, or sacrifice the pocket-ability of the iPhone. Personally, I would have have liked to see Apple prototype a 4-inch, 3:2 ratio display. It would give up some pixel density, staying at 960x640 but reducing the ppi to 288, and it wouldn't have increased the amount of information that could be displayed, like the 1136x640 resolution does. It would, however, have made everything bigger, including text, and it would have maintained app compatibility. For some, any change from the original 3.5-inch screen will be too much. For others, anything less than 4.5-inches or more is too little. 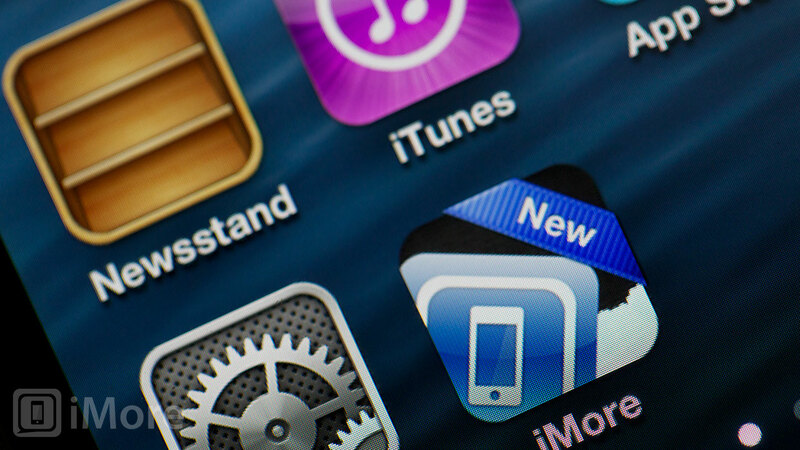 Apple typically ignores the fringes and aims squarely at the mainstream middle. This year 4-inches at 16:9 was the first and biggest compromise Apple was willing to make, and the best one in their opinion. In addition to making the iPhone 5 display taller, Apple has also made it thinner. To do this, they used in-cell technology. This allowed Apple to combine the touch sensor into the LCD display, turning what were previously 2 discreet layers into a single layer that's 0.5mm thinner. That might not sound like a lot, but when you consider the iPhone 5 is only 7.6mm to begin with, it's significant. The iPhone 5 display is still an LED-backlit LCD, so it's still bright and beautiful. It's remains IPS (in-plane switching) so the viewing angle remains tremendous, but in-cell makes the iPhone 5 display even better. If the iPhone 4S and iPhone 4 looked like traditional cell animation, with images painted right below the glass, the iPhone 5 looks like those images are painted right into it. Once again, it looks so good it almost seems fake, like a sticker instead of a screen. It also makes the iPhone 5 easier to use on a sunny day. Not exceptionally so, not even at a high brightness level, but better than previous generations. Add to that a 44% greater color gamut, and blacker blacks, and you have richer, truer images for everything from interfaces to avatars, photographs to videos. It's stunning, even when compared to the already stunning iPhone 4S display. 4-inches at 16:9 is a compromise, one that avoids turning the iPhone into a tiny tablet, or losing the density and the specific type of usability Apple values. The in-cell Retina display itself is not. As of right now, it might well be the best display in the business. Apple says that the iPhone 5 is twice as fast as the iPhone 4S, which sound impressive enough. 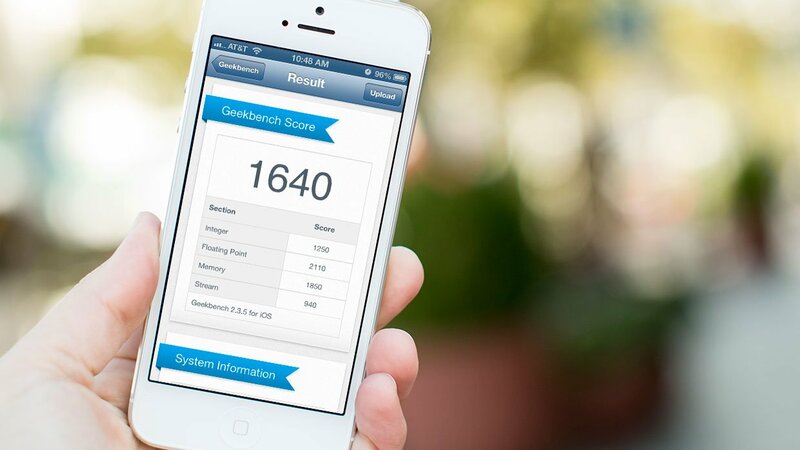 Apple doesn't typically talk in GHz or RAM when it comes to iOS devices. They prefer to bring experience to a spec fight. But specs drive the experience. They're the engine in the meticulously appointed car. They're stats behind the championship team. They're the science behind the art. In this case, they're the Apple A6 system-on-a-chip (SoC), the first custom processor to grace the iOS platform. Previous versions of Apple's A-series, including the A4, A5, and A5X, all ran existing processor designs like the ARM Cortex A9. This year, instead of sticking with the Cortex A9 or moving on the new ARM A15, Apple zigged instead of zagged. They licensed the ARM v7s instruction set and rolled something uniquely their own -- a 32nm CMOS dual-core Apple CPU that can run from between 800MHz and 1.2GHz. Likewise, instead of going with the dual-core PowerVR SGX543MP2 graphics chip found in the iPhone 4S, or the giant quad-core PowerVR SGX543MP4 found in the iPad 3, Apple went with the triple-core PowerVR SGX543MP3 GPU. And they topped it all off with 1GB of RAM. Storage isn't any bigger or any faster this year -- you have the same 16GB, 32GB, and 64GB options you had before -- but everything else about the iPhone 5 feels perceptively faster, and it's almost all because of the custom Apple A6. I didn't think Apple would go the custom CPU route for another year or two, but clearly they're investing heavily in chipset architecture and its paying off. Existing between the ARM Cortex A9 and A15, and between dual-core and quad-core PowerVR chips, freed Apple to find the best balance of performance vs. power consumption. What's more, Apple laid out the processor manually. Which is to say, by hand. That's almost unheard of these days, and shows just how seriously Apple is taking every bit and atom of the iPhone's design. Real world performance is more important, however. How long it takes the iPhone 5 to boot, to launch and app or game, to render a website, and to resolve things like location and dictation are what really matter to real people. In that regard, both the iPhone 4 and the iPad 3 bear the burden of being the first devices of their class to have to run Retina displays, and that drained performance away from the overall system. With that already "paid" for, the iPhone 4S flew, and the iPhone 5 flies even faster. It's so fast now, especially when combined with the new network connectivity (see below) that the mechanics really, truly disappear. Apple nailed the 1:1 multitouch tracking with the original iPhone, but some lag and stutter and delay has always lingered around the edges of the OS. Not any more, at least not that I encountered. 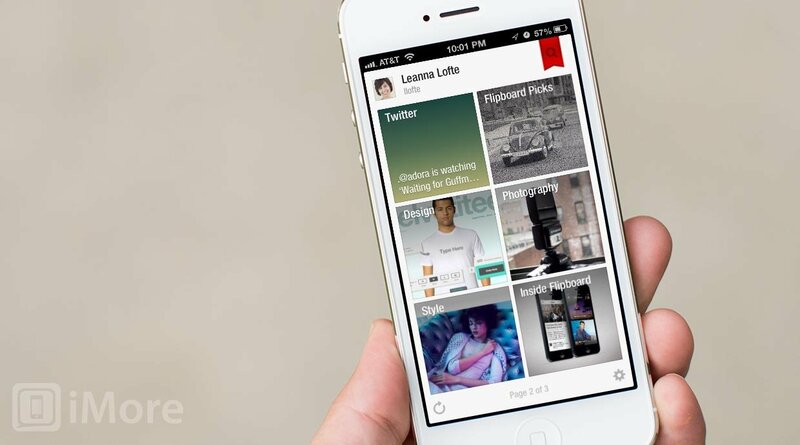 With the iPhone 5, you're not waiting for pixels to push or on-device data to load or system processes to catch up. You're just doing. And you're doing it flawlessly enough that you don't even notice. 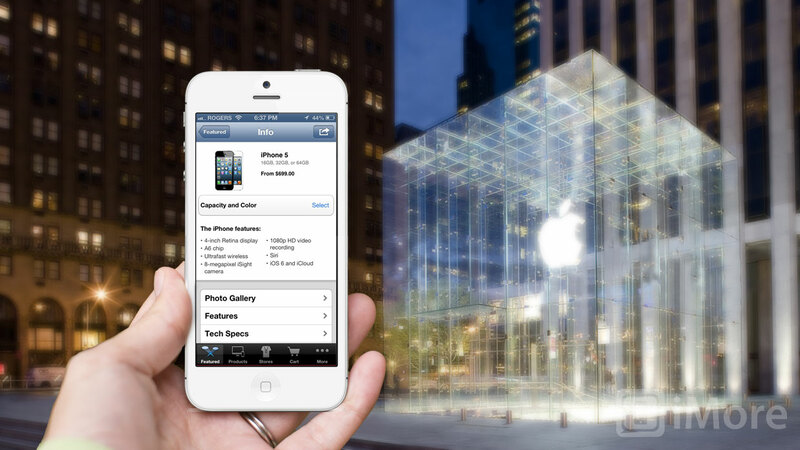 Apple sought to make the iPhone 5 twice as fast as the iPhone 4S and they've succeeded brilliantly. The Apple A6 is an absolute beast. Apple has significantly upgraded wireless networking on the iPhone 5. While 802.11n Wi-Fi has been an option for a while now, the iPhone was previously restricted to more the crowded 2.4GHz frequency. Thanks to a Murata Wi-Fi module, which includes the Broadcom BCM4334 chip, the iPhone 5 can use 802.11n on both 2.4GHz and 5GHz. Bluetooth 4.0 has been carried over from the iPhone 4S, and while its low-power, instant pairing holds the same promise today that it did last year, we're still waiting for the accessory industry to catch up and make good on that promise. What there isn't is NFC (Near-field Communications), which is used for commercial transactions, rapid checkins, and other, similar, touch-and-go data exchanges. Apple doesn't seem to believe NFC is the solution to any current mainstream problem, at least not yet. There are other technologies Apple can and is using for similar purposes, like the mobile checkout option on the Apple Store app, but it'll likely be a while before Apple thinks the market is ready for a full-out Apple NFC or NFC-like solution. It's chicken-and-the-egg, of course, but Apple has traditionally been conservative when it comes to radios. They waited until the second generation iPhone to add GPS and 3G, after all, and until now to add LTE 4G. LTE 4G (Long Term Evolution) provides for a theoretical maximum of 100Mbps, which is faster than many home-based ISP connections. 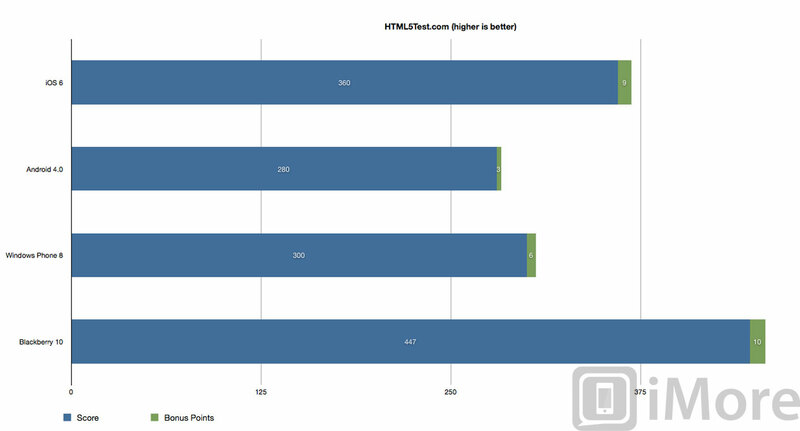 The iPad got LTE 4G support back in March, and performed incredibly well with it. The iPhone 5 adds newer, more advanced radio chipsets -- the Qualcomm MDM9615 and RTR8600. It also keeps the iPhone 4S dynamic antenna design, which reduces the likelihood of attenuation and allows for the best signal connection possible. Model A1429*: UMTS/HSPA+/DC-HSDPA (850, 900, 1900, 2100 MHz); GSM/EDGE (850, 900, 1800, 1900 MHz); LTE (2100, 1800, 850 MHz) for Deutsche Telekom, EE, Optus/Virgin, Telstra, Softbank, SK Telecom, KT, SmarTone, M1, and SingTel. LTE 4G is particularly important for Verizon and Sprint customers. While the iPhone 4S could reach a theoretical speed of 14.4Mbps on the HSPA networks used by AT&T and other GSM carriers, Verizon and Sprint iPhone 4S customers were stuck on EVDO rev A's meager 3.1Mbps. So, customers were forced to choose between fast (AT&T) and reliable (Verizon) or unlimited (Sprint). Verizon had the first and fastest LTE 4G roll out in the U.S., so not being able to take advantage of it, especially considering how slow EVDO is, was especially irksome. No longer. The iPhone 5 on Verizon is now a first class data speed citizen. My tests of LTE 4G performance have been a little strange, however. Given current tower loads, I average 30Mbps on the iPad 3 on the Rogers network. I spike at 30Mbps with the iPhone 5, but average 15Mbps. Tethering my iPad or my Mac to my iPhone 5, however, averages 30Mbps, just as I would expect. I'm inclined to chalk this up to some aberration on my phone or my carrier, however. 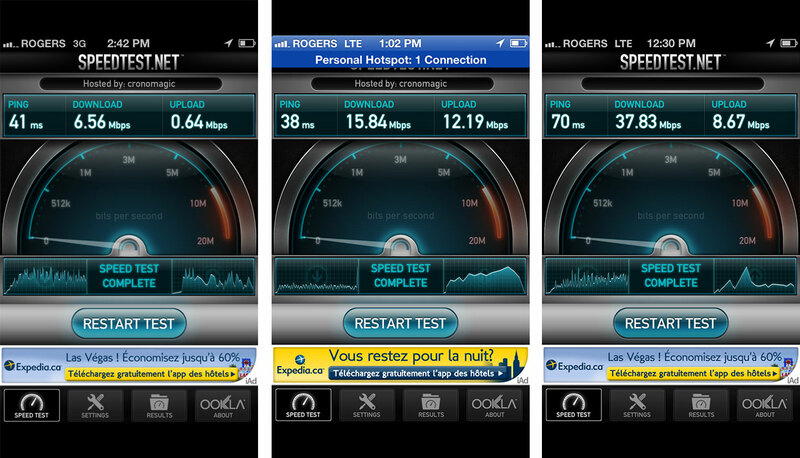 Our community iPhone 5 speed test results show a much more normal, much more expected pattern of LTE 4G results. There are compromises here as well, however. Because Apple is prioritizing battery life, they're doing everything on a single radio with a single process, and because no carrier yet supports VOLTE (Voice Over LTE), the iPhone can't handle simultaneous voice and LTE data connections the way phones that use dual radio connections can. That means, if you're using LTE data and a voice call comes in, you'll drop down to HSPA data on AT&T and other GSM networks. And -- you guessed it! -- because Verizon and Sprint don't offer HSPA/GSM data, unless you're on Wi-Fi, you'll drop completely off of data while you talk, just like EVDO rev. A on the iPhone 4 and iPhone 4S. 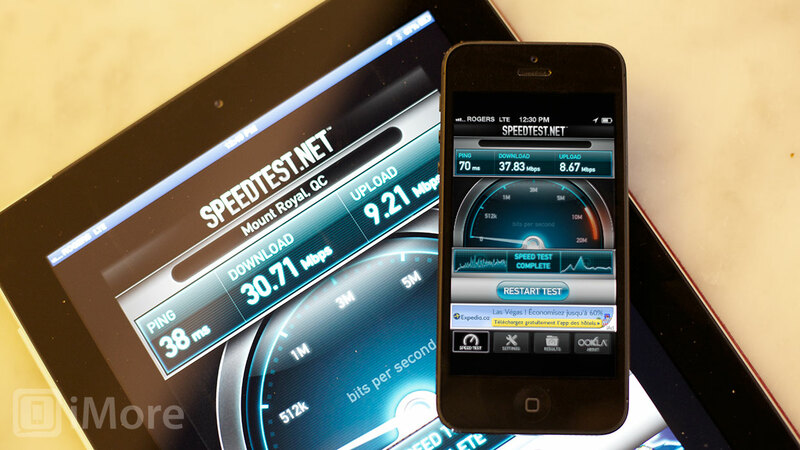 The good news is, in addition to LTE 4G, the iPhone 5 supports speedy DC-HSPA (Dual Carrier HSPA) and HSPA+ data, with a theoretical maximum speed of 42Mbps. Also, unlike early LTE 4G phones, the iPhone 5 seems to handle the drop down to HSPA and return to LTE 4G with incredible speed and grace. 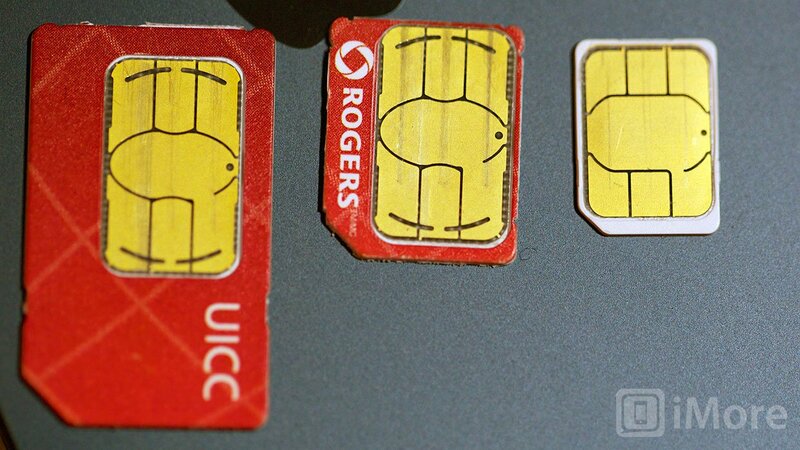 It works well enough in my tests that I doubt most GSM users will even notice the change. In addition to telephone service, with iOS 6, Apple and the carriers have mostly gotten FaceTime enabled over 3G/4G. Mostly. Some carriers -- like AT&T -- are only allowing it on certain plans, which is a move composed of utter cattle refuse. Be that as it may, it's not a feature specific to the iPhone 5 but it is a feature made better by the iPhone 5's LTE 4G networking. As far as I know, Apple still hasn't lived up to their promise to release the open-standards based FaceTime protocol as an open standard, so other platforms beyond iOS and OS X can implement it and make it truly, universally useful. If you are all in on Apple's ecosystem, however, it works incredibly well of LTE 4G. Again, well enough that you don't even realize you're not on Wi-Fi. And when it comes to LTE 4G, that's exactly what you want. On paper, it doesn't seem like the iPhone 5's rear-facing iSight camera got much of a boost this year. It reads as the same 8 megapixels, backside illuminated, hybrid IR filtered, 5-element, f/2.4 aperture camera as last year's iPhone 4S. And, even though the iPhone 5 now has a 16:9 screen, still photos remain 4:3 at 3264x2448px. Likewise, the LED flash seems to look and work the same as last year. Apple does list some improvements to the iPhone 5 iSight, however. There's a new, dynamic low-light mode that combines pixels together for what Apple claims is up to 2 f-stops better performance. Apple also claims the 5-element lens has been aligned with even greater precision for even greater sharpness. Also, the surface of the iSight is now made out of sapphire crystal to make it more scratch resistant. The Apple A6 chipset lends a hand here as well, with a new image signal processor (ISP) that allows for spatial noise reduction by looking at surrounding pixels to better detect and remove noise, especially in low-light conditions, while at the same time preserving large areas of contiguous color. It also makes getting to the camera, both through the fast camera swipe on the Lock screen and the Camera app itself, much quicker, and increases the shutter speed to make taking a photo faster as well. Apple says 40% faster, but regardless of the exact number, it's a perceptible increase. Most impressively, Apple has done all this in a camera that's 25% smaller than the one in iPhone 4S. Camera lenses dislike thinness, but humans like thinner phones. While some other manufacturers have resorted to adding crude bumps to allow large cameras on the backs of their otherwise thin phones, Apple's compromise here was to keep the same quality camera, enhance it slightly, but engineer it into the 18% thinner iPhone 5 body. That's a remarkable feat of engineering. So, boiling it all down, photos are much faster to take on the iPhone 5. 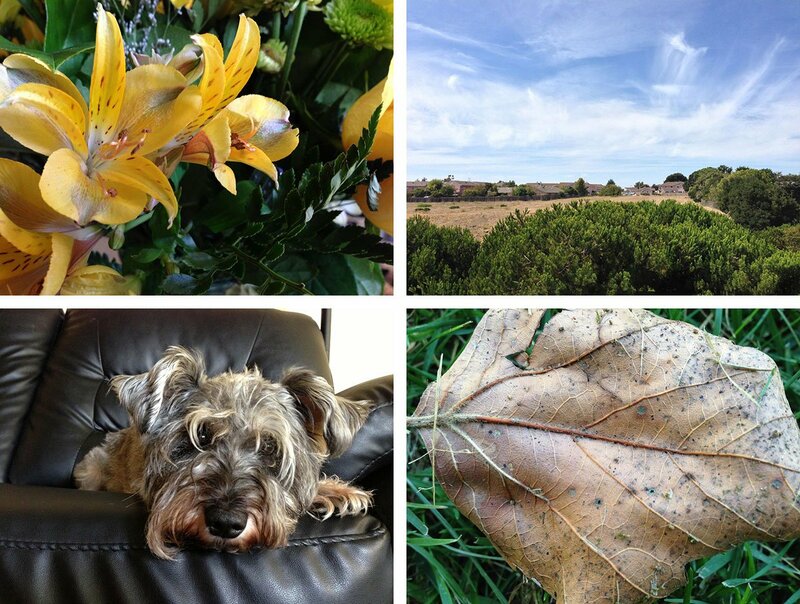 Standard photos look great, though about as great as you'd get on the iPhone 4S. They do seem much, much better on screen, however, but only because the iPhone 5's display is so much better. HDR (High Dynamic Range) photos show marked improvements, and so much so that if you're taking landscapes you'll want to turn it on and leave it on. Sadly, while low-light has also improved and noise has been reduced, it's not by much and blur will still occur if and when your subject moves. Happily, Apple seems to have fixed the problem with focus that plagued macro shots on the iPhone 4S. You can now get really close without worrying that your subject will elude capture. If you're looking for the highest end glass you can hang off a phone, however, Apple's not on that particular bleeding edge. 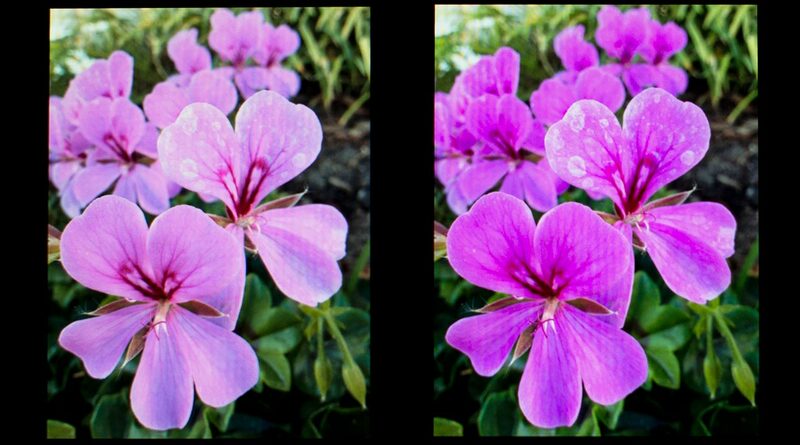 Nokia recently grafted a 41 megapixel lens on a Symbian camera just to show they could. Sure, it looks like it's face-hugging the body, but it shoots amazing pictures. Likewise, the upcoming Nokia Lumia 920 will use a much less pornographic version of the same PureView system, including an optical image stabilization system that actually floats the lens hardware, allowing the shutter to stay open longer and capture a better photo. Both Nokia and HTC are fielding f/2.0 lenses now as well. But the Nokia Lumia 920 is 10.7mm thick compared to the iPhone 5's 7.6 mm. That's the tradeoff for someone who values a light, thin phone that can also shoot really good photos. While not unique to the iPhone 5, iOS 6 also has a new panoramic photography mode built-in. It uses the iSight in standard mode, so you don't get many of the benefits of the iPhone 5's specific iSight camera, but it still lets you make remarkably good looking panoramas at up to 240 degrees and 28 megapixels (~10800x2332px), with remarkably little effort. The front-facing FaceTime camera is still meant more for videos than stills, but since it's been upgraded from 0.3 to 1.2 megapixels and given backlight illumination and face detection, if you need a new avatar or profile pic, you'll get a much better one with the iPhone 5 than you would have with any previous model. For anything else, you'll still want to use the iSight on the back. Previously, if you wanted to capture a photo while recording video, you had to press Home and the On/Off button at the same time to grab a screenshot, either while you were filming, or later, while you were playing it back. 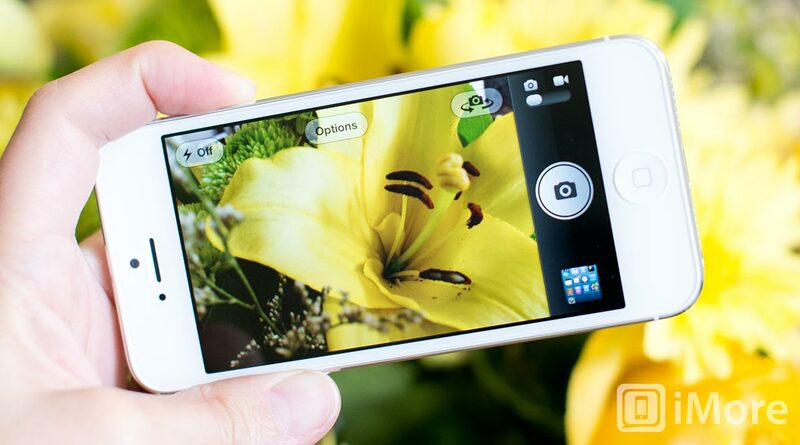 Now you simply tap the Camera button and a photo gets taken while video continues to record. And with excellent shutter speed too. There is a compromise, however. Photos captured while recording video are only 1920x1080px resolution. That's significantly smaller than the still camera's 3264x2448px. For most situations, however, the convenience eclipses the pixel cost. Like with stills, lowlight performance has been nominally improved for iPhone 5 video, though it varies from slightly to unnoticeably depending on the specifics of any scene. Either way, there'll still be grain. Video stabilization, however, has been more noticeably improved, though it can still shimmer at times when motion is minimal. Face detection for up to 10 faces, previously available on the iPhone 4S for still photography only, is now also available for video as well on the iPhone 5. The front-facing camera has had a more significant update, with Apple finally bringing the same 720p FaceTime HD capability to iOS that they brought to the Mac over a year ago. It works great, especially compared to the profoundly lackluster VGA camera that preceded it, and is now more than good enough for a video call or a YouTube-style chat-at-the-world video. Back when Apple introduced the iPhone 4, they added a second mic to the top. 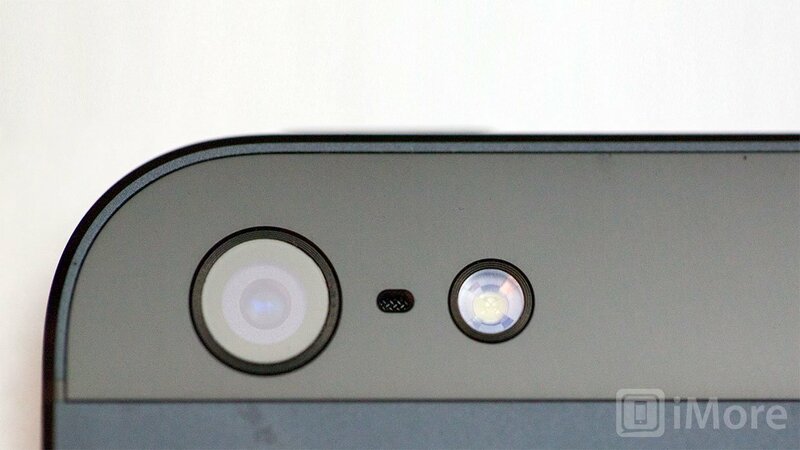 With the iPhone 5 they've added a third mic, nestled between the iSight camera and the LED flash on the top back. Along with the traditional mic at the bottom, all three are multifunctional, now in recognition of the multifunctional ways we now use our phones. Having all three spread out the way they are means that whether you're using your iPhone as a phone, as a speaker phone, for a FaceTime call, to record a video, or to use Siri or Dictation, there's a greater likelihood you'll be heard. It also means there's a greater chance one of the mics will be well-positioned for noise-cancellation. Having three mics also means Apple can do beamforming, allowing Siri and Dictation to better discern words from the noise around them. Apple has also -- finally -- paid some attention to the main speaker at the bottom of the iPhone. 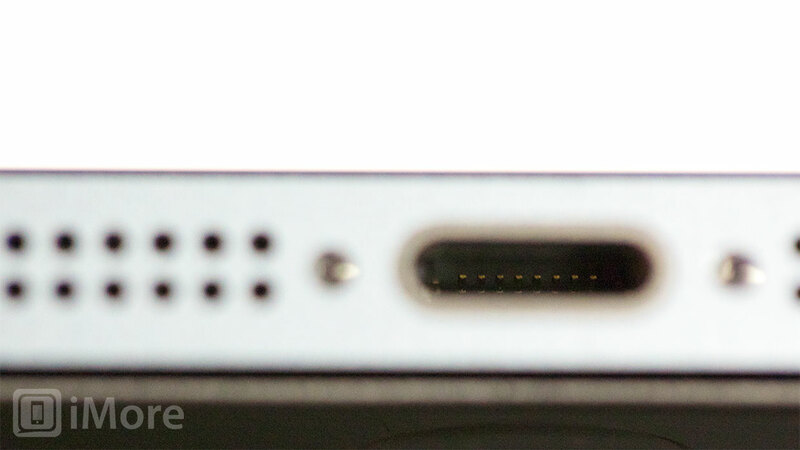 With the iPhone 5, it now has a five magnet transducer, up from the two magnet transducer in previous models. Apple says that gives a better frequency response, even though the speaker itself is now 20% smaller. In our tests, the speaker did sound louder and slightly clearer, but not blow-your-hair-back better. While I certainly wouldn't want gimmicks, it would be nice for Apple to continue do everything they can to improve external speaker quality -- they are the company that brought us iTunes + iPod, after all. For everything from conferencing to hands-free to FaceTime calls, when you don't have a headset handy, the main speaker simply has to deliver. The iPhone 5 earpiece speaker has gotten noise cancellation now as well, which aids in removing ambient sounds and makes conversation cleaner and clearer. Apple has also added support for wideband audio (HD Voice being a popular brand thereof), which uses a compression method that better fills out the frequency spectrum to make voices sound more natural, and pulls them out from surrounding audio to make them more distinct. (Would that Music.app could apply it to undo the effects of AutoTune...) However, wideband audio requires carrier support and compatibility, and not all carriers support it yet, and of those that do, not all are compatible with the iPhone. Apple did say they had 20 carriers ready with wideband audio at launch, including Deutsche Telekom and Orange, but that's few enough that it should still be considered more of a bonus at this point than a standard feature. In other words, it's a big mess, and we'll probably have several more generations of iPhone released before most of us see the benefit of it. Anecdotally, however, calls I've made with the iPhone 5 do sound much better and sometimes much more human than any cellular phone I've used before. For the vibration module, Apple has gone back to using the same rotational hardware they used in the original iPhone 4, as opposed to the smoother linear oscillating motor found in the Verizon iPhone 4 and iPhone 4S. That's technically a regression, but the rotational motor is much smaller, and Apple needed to save every millimeter of space they could inside the iPhone 5. 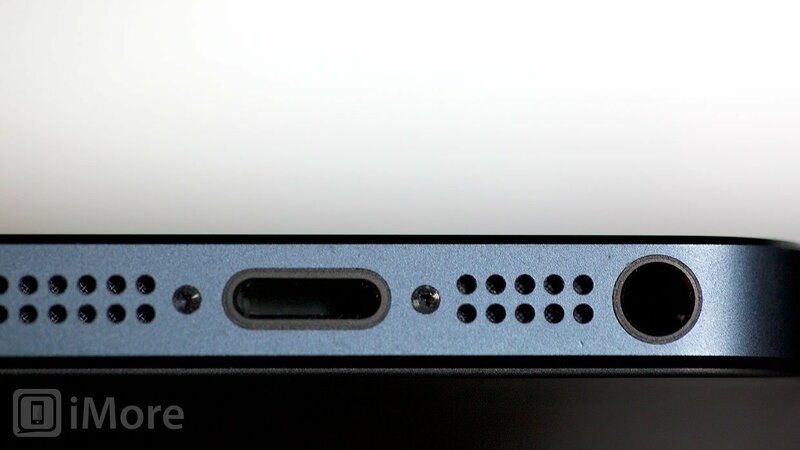 The 3.5 mm headset jack on the iPhone 5 has been moved to the bottom of the device, similar to where it's always been on the iPod touch. This isn't great news for people who liked to put their iPhone in a dock while listening to music or making calls using a headset, but it'll be welcomed by those who frequently pocket their iPhones while doing just that. 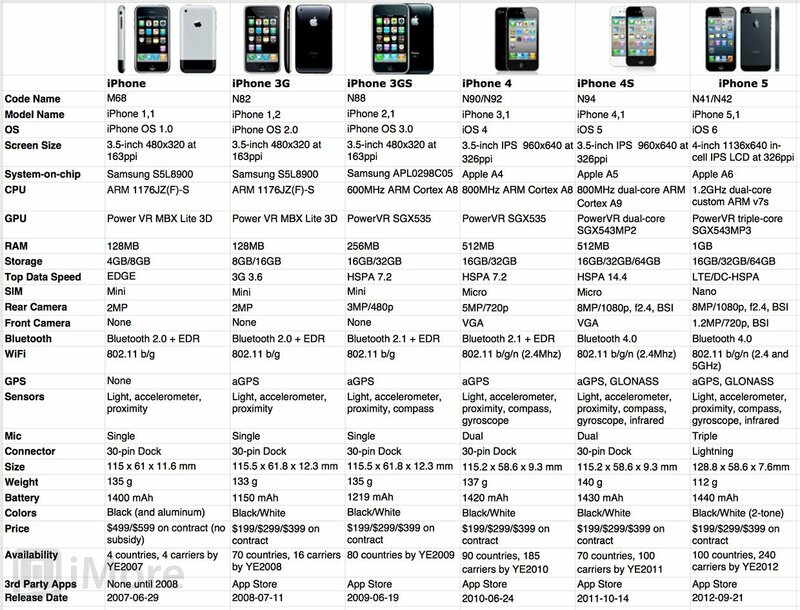 Apple isn't even selling a dock for the iPhone 5, so their numbers probably tell them the latter group is more common than the former. Included in the box with the iPhone 5 is a pair of Apple's brand new EarPods. (They're also available separately for $29.) 3 years in development, they're Apple's attempt to improve upon the ubiquitous but not well loved little white earbuds that previously shipped with iOS devices. 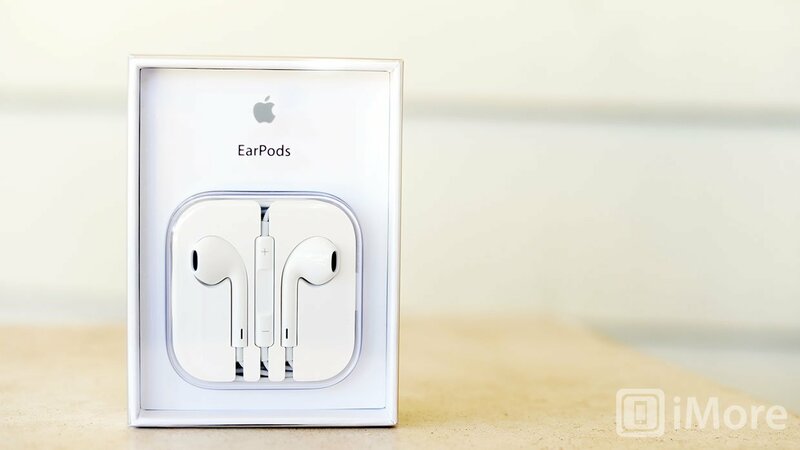 The EarPods come in a proper package, similar to the one Apple's offered with their higher-end in-ear headsets for years, which is a great way to prevent tangles or damage in pockets, purses, and bags. 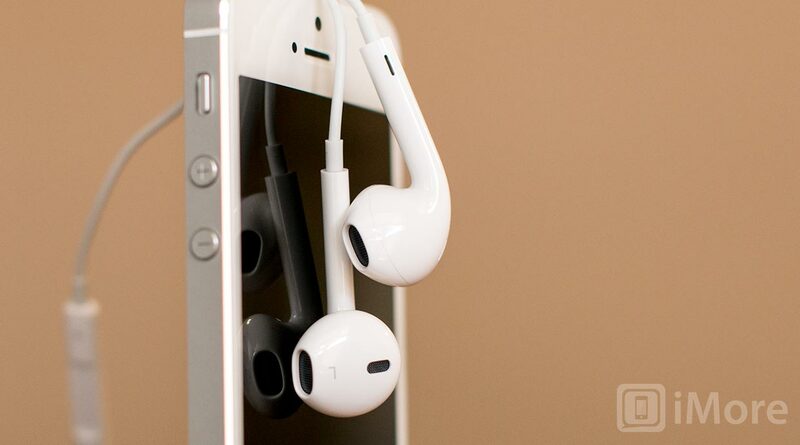 The shape of the EarPods is a significant divergence from the original earbuds. Instead of being uniformly round, the EarPods are asymmetrically shaped and, according to Apple, ergonomically designed to better fit a wider range of ears. No one product could ever truly fit every shape and size of ear, however. The original earbuds wouldn't stay in my ears for more than a few moments, and I've even found high end in-ear headsets challenging to keep in. The EarPods are much better than the earbuds ever were in that regard, though still not perfect, at least not for me. Sound is noticeably improved with the EarPods, however, especially clarity and bass. A large part of that is due to their new, multi-port design. The main EarPod speaker directs sound into your ear. The port on the back is tuned to mid-range frequencies and is intended to improve consistency of experience. Ports in the stem are meant to improve bass. Air channels reduce pressure on the speaker so it can concentrate on providing greater low-frequency sound. The remote and mic functions the same with the EarPods as it did with previous iPhone earbuds, allowing you to control both music and phone calls. The in-line remote is larger now, though, making it much easier to fumble for and use in real-world situations. The new Apple EarPods won't replace your $100+ in-ears or cans, much less your high-end custom jobs, but they're a fantastic replacement for the generally poor earbuds that came before. 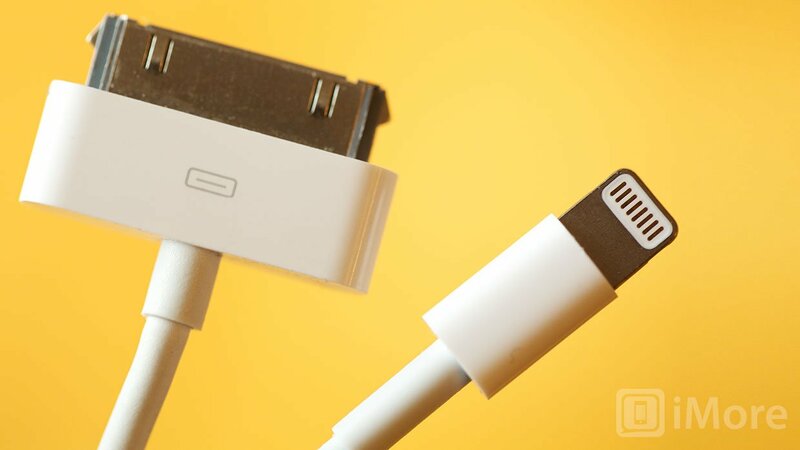 After almost 10 years and who knows how many cables, Apple has officially retired the fat, thick, unidirectional, 30-pin Dock connector and introduced a new, small, thin, ambi-copular interconnect for the next decade. Branded Lightning, it's 80% smaller and offers 8-signals that are all digital. With the advent of technologies like AirPlay, which wirelessly streams video and audio, Wi-Fi Sync which wirelessly exchanges data with iTunes, AirPrint, which wirelessly sends jobs to printers, Bluetooth 4.0 which will -- eventually -- enable a new generation of wireless accessories, and iCloud which cut the cord to the PC, why not just eliminate the Dock connector entirely? Because wired connectors still remain useful for more quickly moving large files around and, critically, for charging. Unlike Palm, Samsung, and Nokia, Apple doesn't yet see wireless charging as viable mainstream feature, and even if they did, it would be years before it could replace wired charging completely. 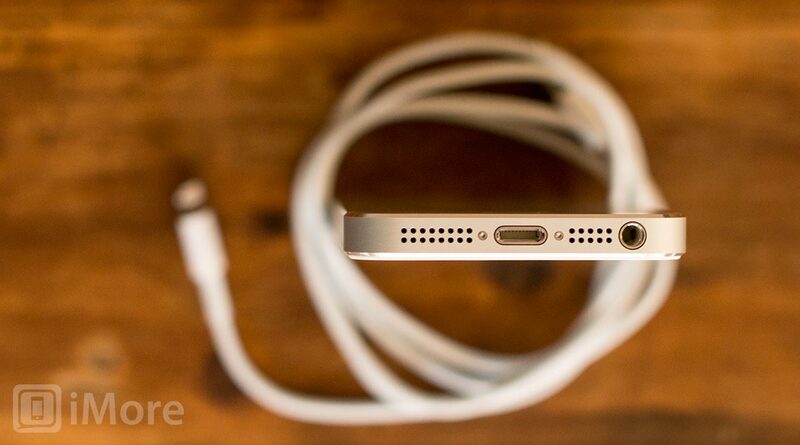 So, the cable has to stick around and, instead of eliminating it, Apple's making it smarter. For legacy accessories, Apple is currently offering 30-pin Dock to Lightning adapters, both with and without a short extension cord. To comply with European Union regulations, Apple is also offering a micro-USB to Lightning adapter. These don't support video-out, unfortunately, though Apple has said HDMI and VGA adapters will be available at some point. Analog video and serial breakouts for older TVs and scientific instruments probably aren't on the agenda, though, and while it's possible they may appear in some form in the future, changes to Apple's licensing that coincides with Lightning might make it more difficult for small suppliers to manufacture niche cables and accessories, "encouraging" the move to modern video standards and Bluetooth 4.0 for connectivity. I only ever plug my iPhone in to charge any more, and Lightning really makes no difference for that, at least not yet. It requires new cables or adapters that cost money, however, which is annoying. Inarguably, Lightning is better and more modern than 30-pin as an interconnect, but there's no compelling new accessories to "sell" that yet. That might make it sound like all Lightning gives us is pain and turbulence right now, but there is one killer new feature that Lightning did immediately enable -- a thinner iPhone. The iPhone 5 has a lithium-ion battery that can be charged via the included Lightning cable connected to a powered USB port or an AC adapter. The iPhone 5's battery is 1440 mAh, which is up 10 mAh from last year's iPhone 4S. Talk time on 3G is rated the same 8 hours as the iPhone 4S, though standby time has increased by 25 hours and now reaches 225 hours. (There's no voice over LTE yet, so no LTE talk time.) Internet use time is also up, increasing 2 hours on 3G and 1 hour on Wi-Fi to 8 and 10 hours respectively. The iPhone 5 is also rated for 8 hours on LTE. Audio and video playback remain 10 and 40 hours respectively. 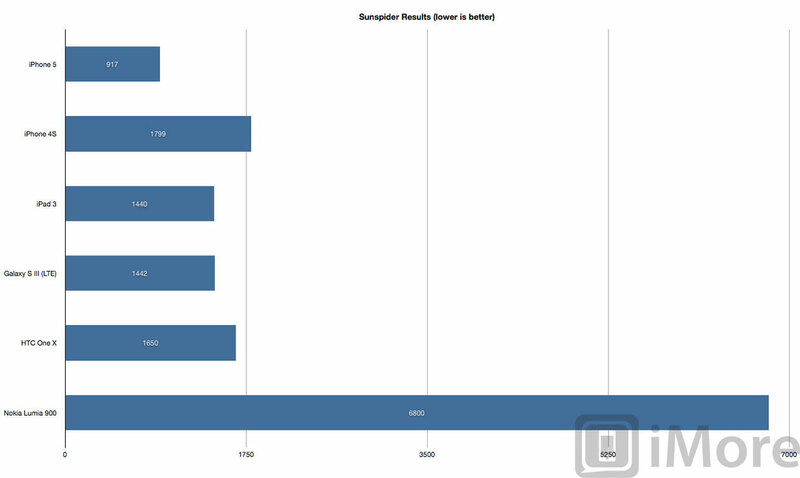 In our tests, Apple's numbers have proven roughly accurate. Leaving an iPhone 5 for extended periods of time, for example overnight, has resulted in minimal battery drain, and with moderate use the iPhone 5 has easily lasted a day. With heavy use, like a day on the road or at a conference, you'll need to re-charge, perhaps more than once. 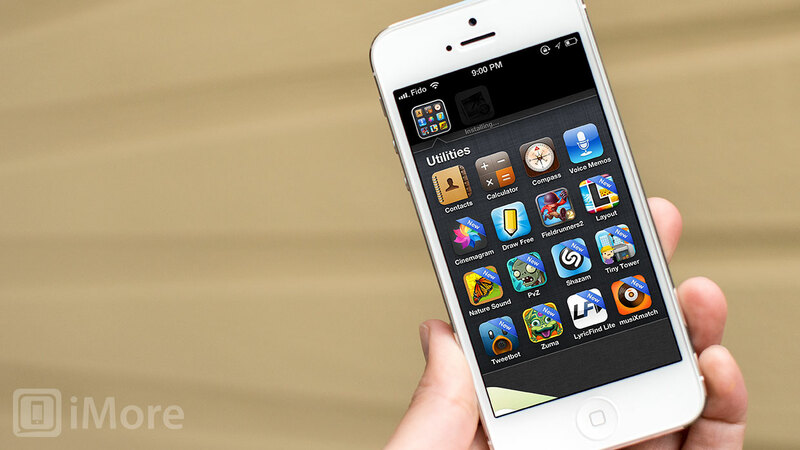 Carriers and signal quality have traditionally also played a huge part in iPhone battery life. With previous iPhones, when I've left Rogers and roamed on AT&T, my battery life has taken a huge hit (I could literally watch it drain as the radio screamed, trying to get a signal.) We've seen similar results with a Rogers iPhone 5 roaming on AT&T -- significantly lower battery life. 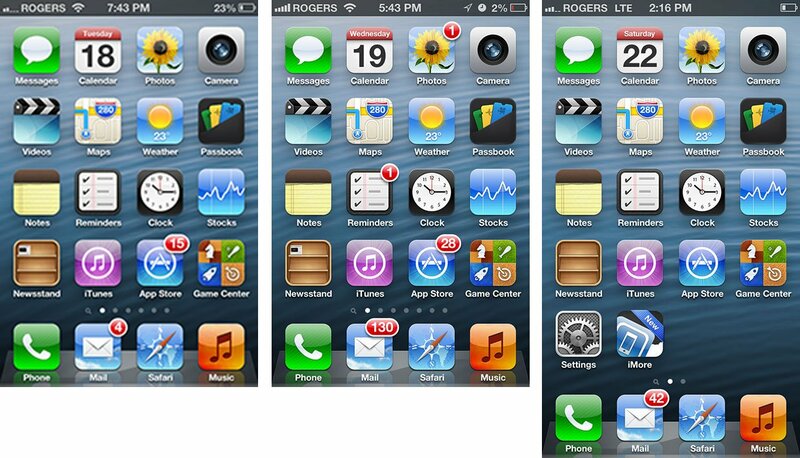 This review covers the iPhone 5 on a good carrier with a strong, consistent signal. Anything less and battery life will suffer. Because of all the push, location, and iCloud services in iOS, and the speed of LTE data, you can hit the iPhone 5 really hard if you try. 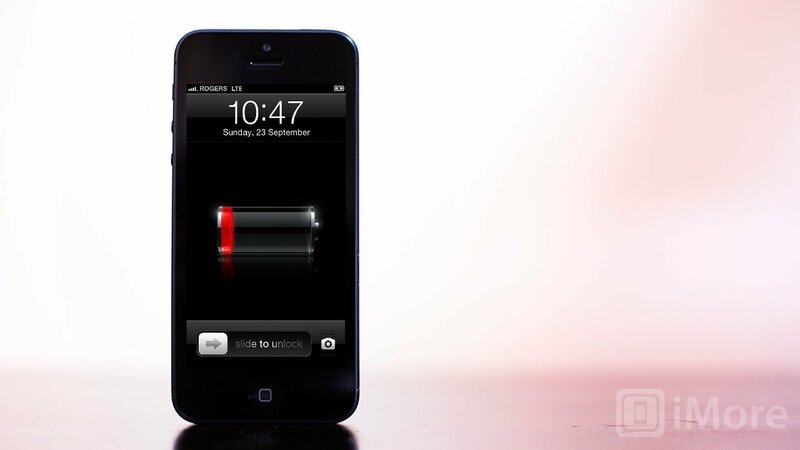 If you restored from a previous iPhone, you could also have problems at the system level that reduces battery life. If you set up as a new iPhone and are still having issues, check with Apple. On an iPhone 5 that was set up as new, and running a decent amount of push, location, iCloud, and other services, my battery life has been excellent. Otherwise, until battery packs and battery cases are updated for Lightning and the new design, you'll need adapters and maybe some McGyver skills. The iPhone 5 ships with iOS 6, which boats over 200 new, customer-facing features including an all new Maps app, new Siri functionality, deep Facebook integration, shared Photo Streams, Passbook, new capabilities for Phone, Mail, and Safari, FaceTime over cellular, enhanced Accessibility, and improved support for China. Unlike previous years, where video recording, FaceTime, and Siri were all exclusive to the new hardware, almost none of the new features in iOS 6 are exclusive to the iPhone 5. Make of that what you will. 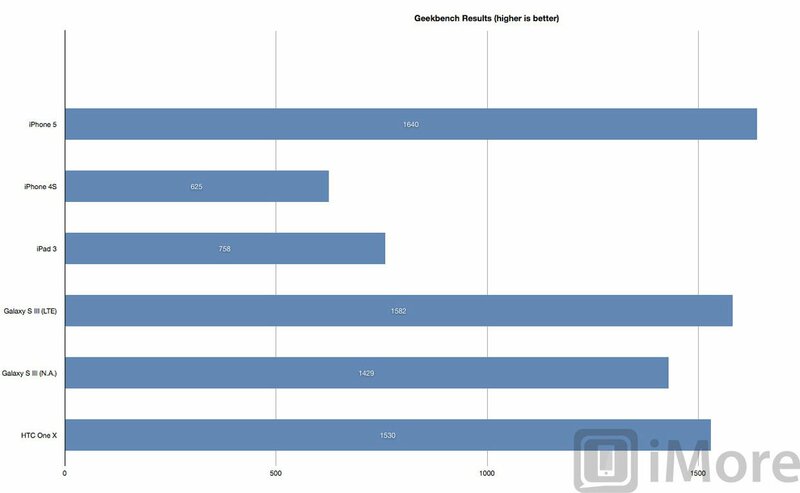 The major difference for iOS 6 on the iPhone 5 is the change in aspect ration from 2:3 to 16:9, and in pixel count from 960x640 to 1136x640. That means everyone from Apple to App Store developers have an extra 176x640 pixels to play with. For Apple, 16:9 allows for an extra row of icons on the Home screen and in folders, an extra list item in Mail or in Music, and a bigger display area in Maps and FaceTime. Since, unlike the iPad, the iPhone is based on a single-column interface, the lack of additional width is seldom if ever an issue in portrait mode. Curiously, Apple isn't vertically centering album art on the Lock screen with the iPhone. Hopefully that's a bug scheduled for imminent squash-age. What Apple hasn't done, however, is take any advantage of the bigger screen on the system level. Banners still overlap and obscure menu bar buttons instead of elegantly pushing them down, and notifications still don't present any actionable interface for quickly replying to a text or adjusting an alarm. And there's no bonus number row on the portrait keyboard. Apple has used those extra 176x640 pixels merely to add more content, not add more functionality. Hopefully it's early days still, and future versions of iOS will do something more interesting with the space. 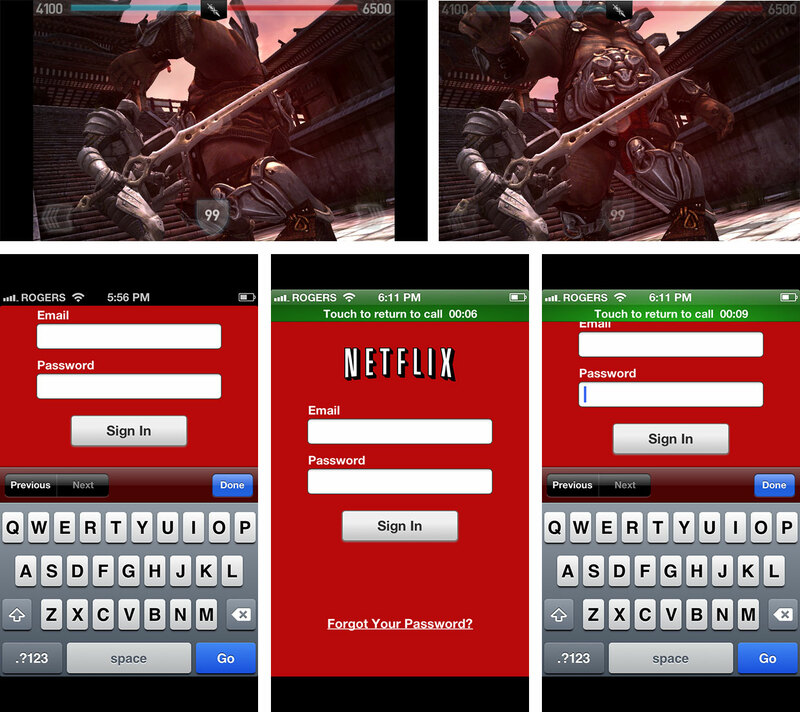 For third party App Store apps, developers have to add support for the 16:9 display and signal it by including a special PNG file in their build. Many developers have already updated their apps. 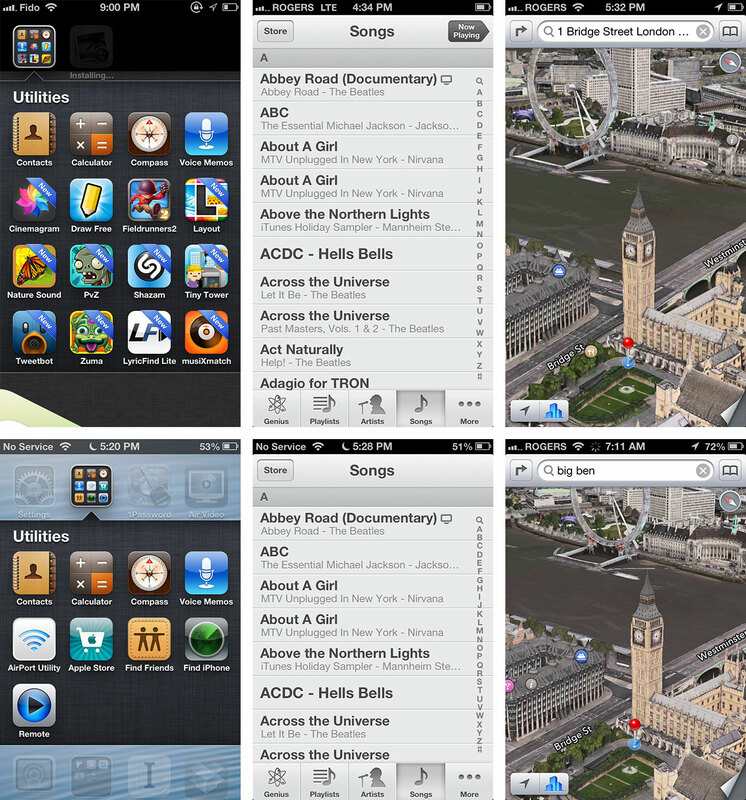 Most of these are list-based (UITableView) or grid-based (UICollectView) or use new, flexible methods (AutoLayout) that allow for relative positioning regardless of screen size. That's important, because they still have to support 3:2 on older devices still on the market and still being sold. Likewise, games that use OpenGL can go 16:9 but could still have interface elements that require work to get right. Apps or games with a ton of custom graphics will have to be redone, and redone in a way that lets them properly fill the screen, regardless of which screen they have to fill. That'll take time. Until then, Apple will letter-box them (or pillar-box them in landscape mode), centering them on the screen and filling the empty space with black. 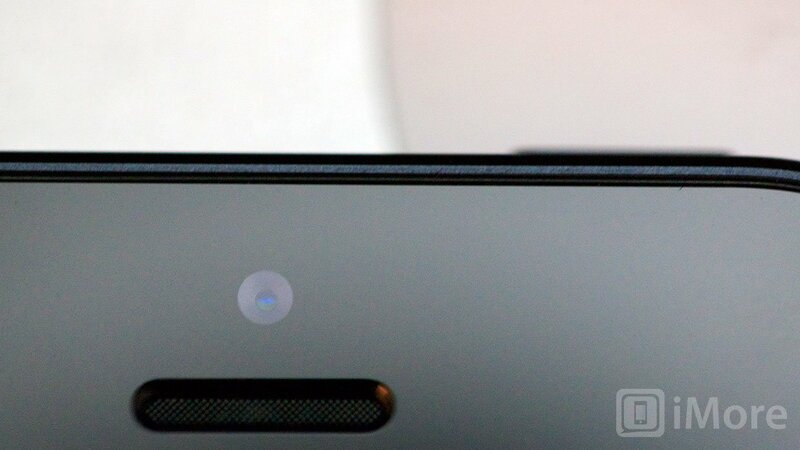 On the new black and slate iPhone, it's almost invisible. On the white and silver, it's more visible. 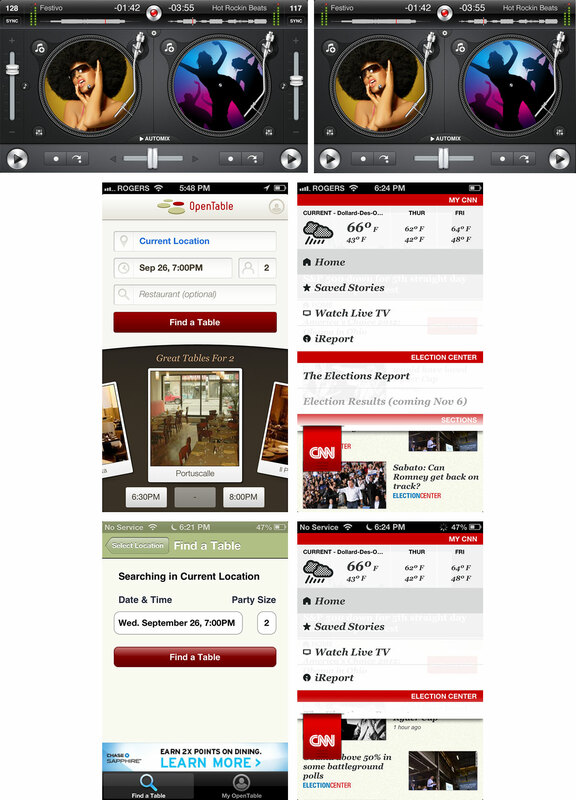 Unlike Apple, some App Store apps are offering different interfaces on 16:9 displays. Given the fat status of binaries already, what with universal apps that support iPhone and iPod touch interfaces and separate iPad interfaces, in standard and Retina (@2x) densities, one of the last things download sizes need is another interface to cram in there. Other apps are simply revealing extra content areas -- opening on 16:9 what is closed on 3:2, or adding something in wide screen that's not there in standard. No doubt we'll be seeing a lot more from developers and designers when they've had a chance to really work on the new hardware. This might seems like a strange combination for a review section, but if you've ever had a problem with your iPhone, it'll make perfect sense. When you buy an iPhone 5 at Apple Retail, they'll help you choose it, set it up, and teach you how to use it. And if you have a problem with it, they'll often go out of their way to fix it for you. Contrast this with non-Apple devices, where your problems are left to the mercy of big box or carrier customer service reps who, even if they're inclined to help you, typically need to mail your device away, a process that can take days or more. And when you get the replacement, while some information can be resynchronized over-the-air or via cable, it's often not an easy or complete process. On launch day, my original iPhone 5 had a chip in the bezel. I returned to the Apple Store, was greeted, explained the problem, and immediately received a replacement iPhone. Then I entered my iCloud ID, and walked out with everything setting, app, piece of content, and bit of data exactly the same as I'd walked in with. A brand new phone, but exactly my phone. No matter how you want to parse it, that's a feature of a phone, one Apple gets right, and one few if any competitors can or will match. The iPhone 5 is compatible with all of the hundreds of thousands of iPhone apps in the App Store, though not all of them have yet been updated to support the new 16:9 display (see Interface, above). The iPhone is not compatible with most previous iPhone 5 cases due to differences in physical dimensions (see Design, above). Some large pouch or bag cases might fit. Most won't. Headsets are compatible, and Bluetooth accessories should be compatible, though we've gotten reports of bugs with some car systems which may require a software updates from the vendor or Apple to rectify. In what might well be Apple's most ambitious iPhone roll-out to date, they promised availability in 100 countries and on 240 carriers. Available now: U.S., Australia, Canada, France, Germany, Hong Kong, Japan, Singapore, and the U.K. Available on September 28: Austria, Belgium, Czech Republic, Denmark, Estonia, Finland, Hungary, Ireland, Italy, Liechtenstein, Lithuania, Luxembourg, Netherlands, New Zealand, Norway, Poland, Portugal, Slovakia, Slovenia, Spain, Sweden and Switzerland. If you don't happen to like iOS or the iPhone at all, there's nothing in the iPhone 5 to change your mind. Get something else. There are several good options already, and maybe more to come. If you've previously been interested in iOS and the iPhone, but the lack of a bigger screen or LTE made you hold off, then go check it out. Chances are you'll like, if not love what you see. It's still the default phone I recommend, and the one that will appeal most to most users. 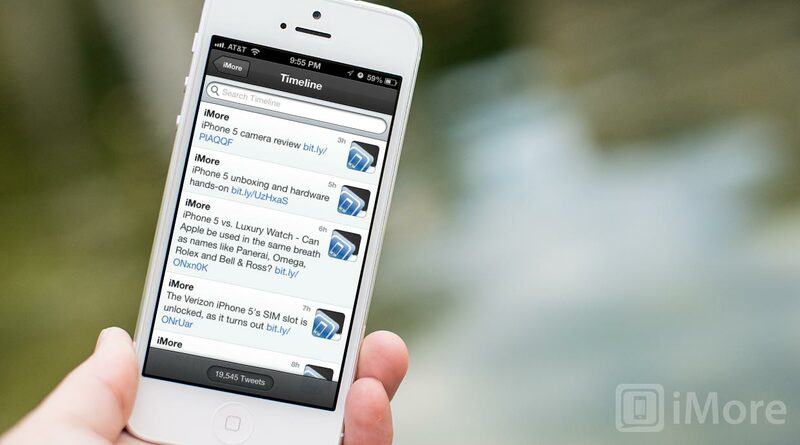 If you currently have an iPhone 4 or earlier, the iPhone 5 is an excellent upgrade. It's everything you love about your current iPhone, only better. Much better. 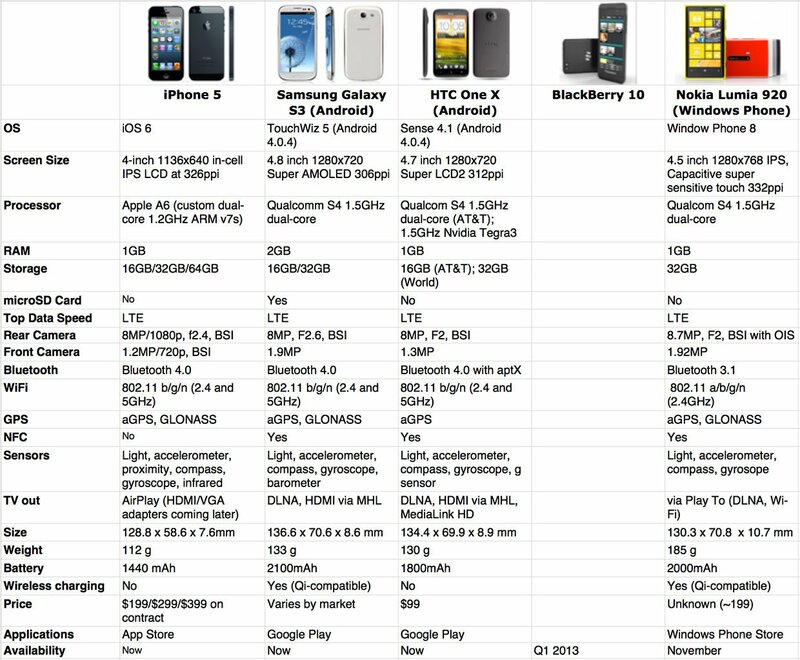 If you currently have an iPhone 4S, unless you really want the bigger screen and the LTE networking, there's little reason to upgrade. The iPhone 4S is still a great device, and iOS 6 does pretty much everything on it that it does on iPhone 5. Apple may have revolutionized the smartphone in 2007 but they're not the only ones bringing their A-game in 2012. 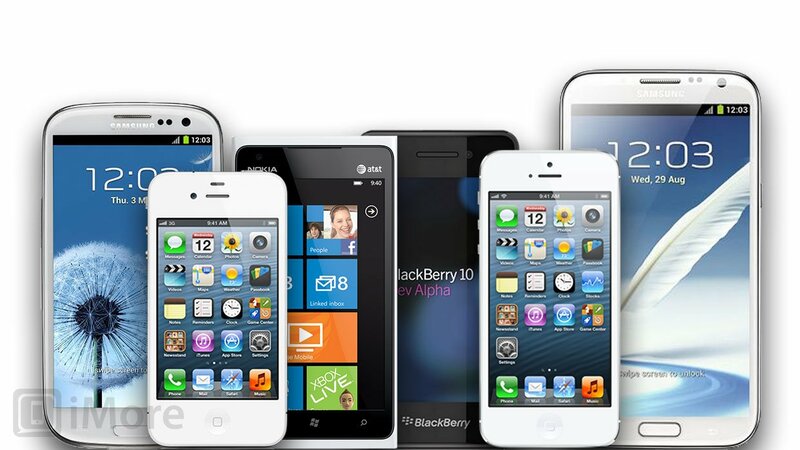 There are now a wide range of highly competitive devices available in most markets, with different form factors, feature sets, and focuses, each of which will appeal to a different type of smartphone users. 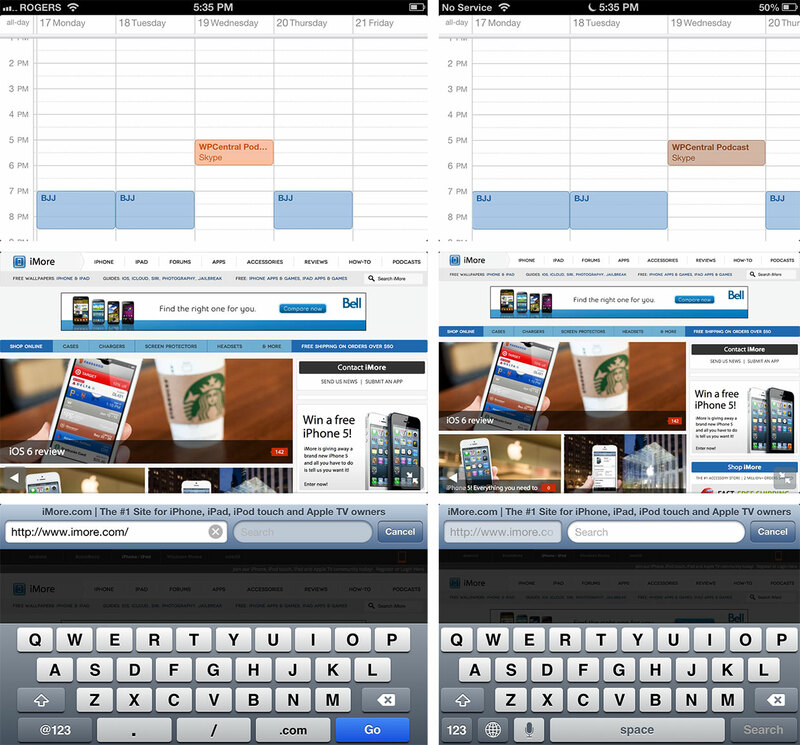 iPhone 5 vs. Samsung Galaxy Note 2: Which one should you get? 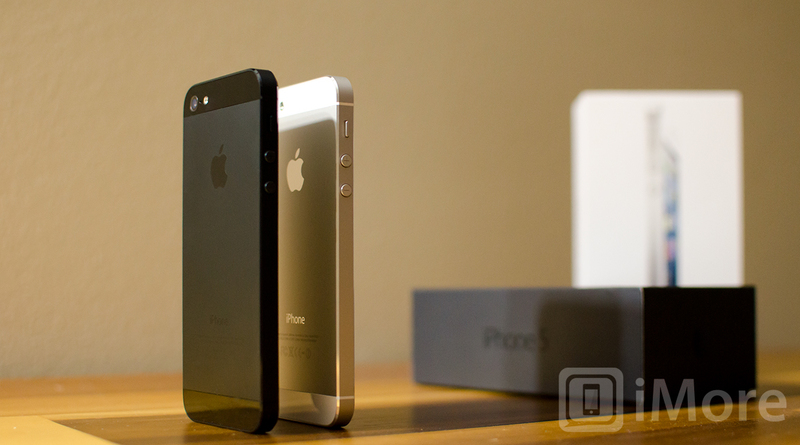 iPhone 5 vs. Nexus 4: Which one should you get? The danger of being overly focused is that you lose sight of the periphery. The key is to be fixed but not fixated. It can be a razor-fine line, and one Apple often seems to cascade down with reckless abandon. Some say Apple is trapped by designs and ideas of the past, obsessed with aesthetics and compromised by self-interest, at war with one-time partners, and oblivious to user pain and competitive pressures. Others, that Apple is better than any other company in the world at determining what exactly the market wants, at pushing the boundaries of manufacturing and technology to make the future manifest now, at taking calculated risks that pay off over years rather than months, and at following precisely-timed revolution with indefatigable evolution, even if it costs them parters, and sometimes customers, over the short term. Elements of both are likely true. One day Apple will come to the end of this iPhone line and they'll have to re-imagine or replace the iPhone the way they have the iPod. But it won't be this day or this iPhone. Taller, thinner, faster, lighter, brighter; the iPhone 5 represents nothing more nor less than the latest, relentless iteration on the Platonic ideal Apple has been striving towards for almost a decade. Redesigned in every way but shape, compromised but true to its purpose, the iPhone 5 is once again the best iPhone Apple has ever made, and one of the best phones ever made. Period.